Open plan classroom designs are gaining in popularity in school designs of the 21 st century. Having become popular for educational reasons in the 1960s and 1970s, many open plan designs were found to be impractical and difficult to teach in because of problems of noise and visual distraction. For these, and other, reasons, many previously open plan schools have had remedial work to convert them to conventional enclosed classroom designs, or to a "semi-open" plan layout. The majority of new schools built in the latter part of the 20 th century opted for the more traditional design with enclosed classrooms. The literature reviewed in this article has been obtained by a search of databases and national and international journals in the acoustics, education and psychology fields, to identify relevant articles, reports and theses published in the past 60 years. Open plan classrooms became popular around 50 years ago following the progressive educational reform movements of the 1950s and 1960s. Before this time, pedagogy largely consisted of didactic teaching, with the teacher speaking in a fixed position at the front of the class and the pupils listening from formal rows of desks. The years following the second world war witnessed a breakdown of this formality, as education began to focus on the individual needs of the pupils rather than the "convenience" of teachers. , Reflecting the changing political times, the new generation of educationalists was seen to reject anything considered authoritarian. These progressive philosophical changes were apparent in the organization and arrangement of the classroom; didactic teaching was replaced with experiential learning centered on individual assignments and group work. ,, The new educational methods placed an emphasis and focus on the child rather than the teacher, and were embodied by a "child-centered" pedagogic approach. During the changing social and political climate of the 1970s and 1980s, there was criticism of this child-centered approach to learning and classroom design, and politicians and educators called for a return to more traditional values. As a result, the proliferation of open plan classrooms (which were synonymous with progressive teaching styles) declined rapidly in favor of a return to more traditional education. However, there have been very few rigorous studies which have examined the effects of noise on performance in open plan schools, rather than in enclosed classrooms. Weinstein's carefully designed experiment  assessed the effect of naturally occurring background noise on students' reading performance within a fully open space school, whilst controlling for factors such as fatigue, individual ability, class teacher, and time of day. The study found no significant effect on reading error rate between "quiet" and "noisy" periods of intrusive noise from adjacent classbases, but a slight tendency to work more slowly in noisy periods. However, the study emphasized that results were not necessarily applicable to schools where background noise levels were higher, and that noise was still likely to affect annoyance and speech communication, and to reduce the number of available teaching options. In another study, Barnett et al,  compared the performance on an auditory selective attention test of two groups of children, one group who were taught in open plan, and the other in enclosed classrooms, all classrooms having similar average noise levels during lessons and similar densities of pupils. They found that the children in the open plan school performed significantly better than the other children. This suggests that children in open plan classes may habituate to intrusive noise and find it less distracting to their attention than children in enclosed classrooms. However, there is a lack of data on the impact of intrusive noise upon children's cognitive processing in open plan classrooms. In Shield and Dockrell's study on children's perceptions of noise in UK primary schools,  children reported that the most difficult listening scenario was when other children were making a noise outside the classroom. In open plan schools, speech from adjacent teaching areas has been cited as the most common cause of disturbance ,,,, and perceived by both teachers and pupils to be a problem. ,, The level of distraction in open plan schools is attributed to "individual perception, social conversation, movement and noise". Irrelevant meaningful speech has been shown to be a particularly distracting source of noise compared to other sources at equivalent levels  due to the associated meaning in speech;  thus open plan schools are particularly vulnerable to this effect. A recent, large-scale survey of children in semi-open plan primary schools in the UK  found that children perceive themselves to be significantly affected by intrusive speech from pupils and teachers in adjacent classbases, in terms of noise annoyance and their ability to hear the teacher in critical listening situations. Children's perceived ability to hear their teacher decreases as activity in adjacent classbases increases to include movement. Excessive noise levels and lack of acoustic privacy have been frequently identified as the most undesirable aspects of open plan schools. ,,,,,,,, The majority of studies focusing specifically on acoustics in open plan classrooms were carried out during the 1970s, and many of these concentrated on fully open plan designs with no fixed divisions between teaching areas. While there have been several surveys of noise in enclosed classrooms published over the past 20 years, ,,,,,, there is a paucity of data relating to the more recent open plan designs. [Table 1] summarizes the surveys of noise in open plan classrooms, which have been carried out since the 1960s. It can be seen that the levels measured during classroom activities in these studies are comparable with those measured in enclosed classrooms. Thus, despite the common perception that noise levels are higher in open plan than in enclosed classrooms, they appear to be very similar in the two cases. Four of the studies cited in [Table 1] have made a direct comparison between noise levels in open plan and enclosed classrooms (Kyzar,  Barnett et al, Finitzo-Hieber et al, Mackenzie and Airey , and Fitzroy and Reid  ). 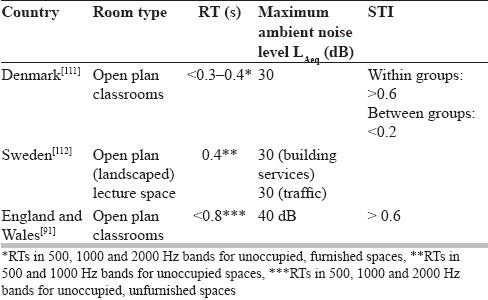 Of these, only the study by Finitzo-Hieber et al, found significantly higher average noise levels in open plan classrooms (>3 dB); however, the open plan measurements consisted of noise levels for 100 children sharing a fully open plan area, which is not necessarily typical of today's open plan designs. Barnett et al, compared an enclosed classroom of 30 children with an open plan classroom consisting of two groups of 30 children, but with a similar student density. No significant difference was found between open plan and enclosed average noise levels. This is consistent with the results of Kyzar  and Fitzroy and Reid,  who found a difference of less than 2 dB between average results for open plan and enclosed classrooms. Weinstein  suggested that the reported perceived increase in noise levels in open plan schools "may reflect a lack of control over the intrusive noise levels as much as the loudness level per se0". That is, teachers trying to address a class of pupils who are quiet and attentive need to compete with the intrusive noise arising from activities in adjacent classbases. The above discussion demonstrates that when children are engaged in classroom activities, the overall noise levels in open plan and enclosed classrooms are similar. Nevertheless, perceptions of higher noise levels, distraction and disturbance by noise in open plan classrooms are consistently reported. ,,,,,, Therefore, it is likely that it is the intrusive noise arising from activities in neighboring classbases, rather than the overall noise in the main classbase, which is critical in causing disturbance and distraction, and interfering with children's ability to hear their teacher in an open plan classroom. Measurement of the intrusive noise level when the main classbase is occupied is difficult under natural conditions since even when the class is involved in a quiet activity, there is usually some contribution from the teacher's speech. Therefore, the intrusive noise level is more commonly measured with the main classbase unoccupied. [Table 2] shows results of two studies in which intrusive noise levels were measured in an unoccupied main classbase in a fully open plan school whilst "normal" activities occurred in adjacent classroom spaces. Both classrooms were carpeted. The classroom in Kingsbury and Taylor's  survey had an acoustic ceiling installed. Although no specific description of the adjacent activity is given, Kingsbury and Taylor's data agree very closely with Weinstein's  data for when adjacent spaces were quiet. The data support the suggestion that when the main classbase is involved in active periods such as group work (around 70-77 dBA), the additional intrusive noise level from adjacent classbases (around 60 dBA from [Table 1]) is not likely to increase the overall occupied noise level. However, for critical listening periods in the main classbase, the intrusive noise level may become problematic during active periods in adjacent classbases; this emphasizes the need for careful coordination of activities by teachers in different classbases. A more detailed survey of intrusive noise levels in open plan classrooms has recently been undertaken. Noise measurements were carried out in 42 open plan classbases in 12 primary schools across southern England. These schools were selected following a survey of all local authorities in England, which identified 122 schools that feature open plan classrooms. The 12 schools surveyed were chosen to represent the full range of classroom sizes, layouts (from 2 to 14 classbases) and designs built between 1973 and 1997. All classrooms included in the survey were of semi-open plan or flexible open plan design as most of the fully open plan schools of the 1970s have had remedial works to modify the open plan design; hence fully open plan classrooms rarely feature in current UK building stock. The intrusive noise was measured with the main classbase unoccupied and with normal activities being carried out in adjacent classbases. The intrusive noise level was measured using a hand held sound level meter (Larson Davis Type 824) in three positions in each main unoccupied classbase: at the "back" of the classbase near the opening (worst case); in the "middle" of the classbase; and at the "front" on the carpet near the teacher's usual speaking position (best case). Short samples of 2 minutes duration were measured and averaged to give the level due to activity in adjacent classbases. This measurement period has been found to give a good indication of fluctuations of noise within a classroom and does not interfere with teaching or children's concentration. The dominant activity occurring in adjacent classbases during each measurement sample was recorded. The average L Aeq,2min levels for each activity are shown in [Table 3]. It can be seen that the results are consistent with those measured by Weinstein. The measured average level for "one person talking" falls within the range of Weinstein's  measured intrusive noise level data for a six classbase unit when adjacent spaces were "quiet" (45-49 dBA). Similarly, the measured data for activities involving movement fall within the range of Weinstein's data for "active" adjacent classbases (55-66 dBA). Criteria for background noise levels in open plan classrooms need to consider distraction and annoyance, speech intelligibility within the classbase and speech privacy between classbases. Recommended criteria vary across the literature. This is likely to be due to differences in subjective methods to measure annoyance and distraction, and individual differences in noise tolerance. Generally, studies have not taken into account the difference between overall background noise level (including main classbase activities) and intrusive noise level, or considered the role of classroom management and organization in controlling noise levels. An occupied noise level between 50 and 70 dBA was recommended for classbases engaged in similar activity to avoid interference  and to avoid impairment of language development. An alternative study recommended a maximum average noise level of 60 dBA. Although not apparent from the article, it is assumed that this refers to an intrusive noise level, as clearly a maximum overall level of 60 dBA, would preclude all but the quietest classroom activities from being carried out in the main classbase. Walsh  measured background noise levels in open plan schools and related these to teachers' subjective dissatisfaction levels. He concluded that to ensure a satisfactory level for teachers, the maximum acceptable background noise level in open plan classrooms should be between 55 and 65 dBA. Walsh  also investigated the fluctuation of measured noise levels throughout the day and related percentile levels (L A10 , L A50 and L A90 ) to teacher dissatisfaction in order to derive limits of acceptability. He defined three regions of acceptability: "acceptable" "marginal" and "unacceptable". The acceptable region corresponds to levels below 55 dB L A50 ; the unacceptable region occurs at levels above 65 L A50 ; while levels between 55 and 65 dB L A50 are marginal. As discussed above, various researchers have attempted to define maximum acceptable noise levels for open plan classrooms. However, most classroom design criteria aim to provide adequate conditions for speaking and listening, and are thus usually expressed in terms of combinations of noise levels and reverberation times to provide good speech intelligibility. Alternatively, a single parameter such as the Speech Transmission Index (STI) or useful-to-detrimental speech ratio, U50 , both of which combine speech to noise ratio and reverberation time, is specified. In open plan classrooms, the issue of speech privacy also needs to be considered to control for intrusive noise from neighboring classbases. The literature generally recommends providing at least 15 dB speech-to-noise ratio throughout the classroom (with reverberation time controlled to 0.5 seconds) to ensure that all participating listeners are able to receive the signal without degradation. ,,, This is supported by the studies of Houtgast  and Bradley,  which showed that in classrooms with occupied reverberation times of less than 1.2 seconds, children's speech intelligibility scores improved as speech-to-noise ratio increased to +15 dBA, before reaching a plateau. However, Bradley and Sato  have recently demonstrated that 15 dBA is only suitable for the older (11-year old) primary school children and that the youngest classes require a speech-to-noise ratio of 20 dBA. For enclosed classrooms, maximum criteria for ambient internal noise levels are derived to provide sufficient speech-to-noise ratio, based on standard voice spectra and assuming that the class is quiet and listening to the teacher during lessons. However, this method is not appropriate for open plan classbases where the background noise level also includes intrusive noise from adjacent classbases. For open plan classbases, the optimum internal ambient noise level is a compromise between providing sufficient masking noise for speech privacy, whilst not increasing the intrusive noise level significantly. For general classrooms, the literature generally agrees a maximum occupied mid-frequency reverberation time of 0.4-0.5 seconds ,, for a speech-to-noise ratio of +15 dB. In their survey of elementary school classrooms, Sato and Bradley  conclude that 0.3 seconds is an optimum reverberation time for occupied classrooms, although near ideal conditions can be achieved over the range 0.2-0.5 seconds (assuming a teacher's voice level of 65 dBA at 1 m). However, using speech intelligibility tests of children aged 6-11 years, Yang and Bradley  found that the effect of varying reverberation is much less than the effect of varying speech-to-noise ratio. In open plan design, control of reverberant noise from adjacent classbases is of critical importance. Petersen  recommends a maximum reverberation time of 0.3-0.4 seconds for open plan classrooms. This is consistent with the findings of Greenland et al,,, that in order to control reverberant noise, the (furnished, unoccupied) reverberation time should be less than 0.4 seconds and the early decay time less than 0.35 seconds. Only two studies, those of Petersen  and Greenland,  have considered a suitable criterion to provide sufficient speech privacy in open plan classrooms. Petersen  recommends a maximum criterion for speech privacy between classbases of STI ≤ 0.2, in order to avoid speech from adjacent classbases becoming intelligible and hence impacting on information processing. An attenuation of at least 15-20 dB between classbases is recommended to achieve this criterion, or 5-8 dB per doubling of distance. Greenland,  however, found that a minimum attenuation of 23 dB between classbases is preferable to allow for high speech levels in neighboring classbases and the needs of vulnerable listeners such as children with hearing difficulties. In recent years, many countries have introduced standards or guidelines on noise in schools. However, only those in Denmark,  Sweden  and the UK  contain criteria specifically for open plan classrooms [Table 4]. In order to achieve the recommended attenuation of noise from neighboring classbases, it is important to maximize the sound absorption of the ceiling and ensure that the height of the ceiling maintains sound absorption effectiveness. Petersen  recommends ceiling absorption of at least 90%, with a maximum ceiling height of 3.5 m. This is consistent with earlier studies of fully open plan classbases. ,, Several studies ,, have found that a fully sound absorbent ceiling is highly beneficial since it not only shortens reverberation time, thus increasing speech intelligibility, but also helps to control reverberant noise build up and noise transmission from adjacent spaces. It should be noted that the recommended sound attenuation cannot be achieved by means of absorptive surfaces alone. Kingsbury  measured around 4.5 dB per doubling of distance in a typically highly absorptive fully open plan classroom. Kyzar  measured 6-9 dB attenuation between teaching spaces in classrooms with only temporary or moveable divisions (cabinets, bookcases or other furniture). Similarly, Yerges  measured less than 10 dB attenuation between groups in fully open plan classrooms. Some form of partitioning (i.e., semi-open plan arrangement) is therefore necessary to achieve the recommended attenuation between classbases. Greenland  also found that a distance of at least 6.5 m between classbase openings would minimize noise transmission between classbases to achieve adequate speech privacy. A buffer space such as an enclosed classroom or quiet room may be used to maximize spaces between openings and hence enhance speech privacy. Carpeted flooring is recommended in most studies ,, but this is mainly to control footfalls and other impact noise (e.g., from furniture movement) rather than to absorb airborne sound. A resilient floor covering or rubber stops on furniture legs are also recommended as alternative solutions. Whilst curtains to classbase openings may be used to provide visual separation, they provide negligible acoustic attenuation. Occupant density has been identified as a major factor in the control of distraction from noise, rather than the total amount of space provided or type of acoustic treatment or partitioning used in a space. ,,, Walsh  demonstrated reductions in classroom noise level of 3-5 dBA due to the presence of an acoustically absorbent ceiling, whilst more significant reductions of 6-10 dBA were achieved following reductions in the number of students in the class, as would be expected. Walsh  demonstrated that the average background noise level increased with pupil density, but then decreased as the density approached that of a traditional enclosed classroom, attributed to the increased sound absorption provided by the children themselves and the reduced level of student activity due to less available space. Greenland et al, found that limiting the number of classbases in the unit (and hence number of children) to three or fewer significantly reduces noise levels. Noise in the classroom may be controlled by approaches to classroom organization and management  as well as alterations to the physical environment and building fabric. For example, Crandell and Smaldino  recommended that children should be situated within approximately 6 feet (2 m) of the teacher to benefit from maximum speech intelligibility. Although this is not possible for teaching typical class sizes when seated at desks without sound amplification, it is easier to achieve when children are closely gathered around the teacher on the carpet. Kingsbury and Taylor  and Choudhury  recommended keeping all students within about 20 feet (7m) of their teacher. In a survey of enclosed primary classrooms,  the most common classroom strategy reported by teachers to combat external noise was raising the voice (33%), followed by specific non-verbal attention gaining strategies (22%). A recent survey of teachers in open plan classrooms  found that they cope with intrusive noise by gathering the class around them (49%), changing the characteristic of their voice (43%) and coordinating teaching activities with colleagues in neighboring classbases (39%). It is important that all teaching spaces are appropriate and inclusive learning environments. Studies of open plan classrooms over the past 40 years have shown that intrusive noise from adjacent classbases is a major problem, reducing speech intelligibility and privacy and causing distraction and dissatisfaction to both pupils and teachers. Measurements of noise levels have remained remarkably consistent over the years and show that noise control measures are required to minimize distraction and annoyance caused by noise, whilst ensuring adequate speech intelligibility and speech privacy. Effective techniques include installation of an absorbent ceiling at a height of 3.5 m or less, linear layout of classbases, partitioning between classbases to achieve sufficient distance between openings and sound attenuation between classbases (i.e., semi-open plan layout), limiting the number of classbases to three or fewer and providing sufficient floor space per child. Such physical measures, while reducing the likelihood of noise problems, allow open plan classrooms to become flexible learning environments, maintaining their advantages to provide for a range of activities. In addition, classroom management strategies may be employed to overcome potential problems caused by noise from neighboring classbases. Compliance with these physical and teaching approaches would minimize the detrimental impacts of noise on learning outcomes in open plan classrooms. 1. Department for Education and Skills. Schools for the Future - Exemplar Designs: Concepts and Ideas. Available from: http://www.partnershipsforschools.org.uk . 2. Mikkelsen A. Hellerup School - A novel teaching paradigm in Denmark. International Congress for School Effectiveness and Improvement (ISCEI), Sydney, Australia. Available from: http://www.ankermikkelsen.dk/dokumenter/ICSEI%202003II.doc. 3. Commission for Architecture and the Built Environment - Creating Excellent Primary Schools - A Guide for Clients. London, UK: CABE; 2010. 4. Wilson O, Dodd G, Valentine J. Classroom Acoustics - A New Zealand Perspective. Wellington, NZ: The Oticon Foundation in New Zealand; 2002. 5. Martinho M, de Silva S. Open plan schools in Portugal: Failure or innovation? PEB Exchange 2008/12, OECD; 2008. 6. Greenland E. Acoustics of open plan classrooms in primary schools. PhD thesis. London, UK: London South Bank University; 2009. 7. Shield B, Greenland E, Dockrell J, Rigby K. Children′s perceptions of speech and hearing in open plan and enclosed classrooms. Proc Inst Acoust 2008;30:10-9. 8. Pearson E. British Primary Schools Today: Trends in School Design. London: Macmillan Education Ltd; 1972. 9. Maclure S. Educational Development and School Building: Aspects of public policy 1945-73. Essex: Longman Group Ltd; 1984. 10. Dudek M. Architecture of Schools: The new learning environments. Essex: Longman Group Ltd; 2000. 11. Brogdan M. Open Plan Primary Schools: Rhetoric and Reality. Sch Organ 1983;3:27-42. 12. Baines G. Some Trends in British Education. London, UK: Institute of Education; c1962-1966. 13. Medd D. The influence of education on the design of school furniture. In: McNicholas J, editor. Aspects of Education no. 21: Open Plan Primary Schools. Hull, UK: University of Hull; 1978. 14. Corrie M. Space for Learning: Teaching and learning in some Scottish open plan primary schools. Edinburgh, UK: Scottish Council for Research in Education; 1974. 15. McNicholas J. Schoolroom to Open Plan: The development of primary school design. In: McNicholas J, editor. Aspects of Education no. 21: Open Plan Primary Schools. Hull, UK: University of Hull; 1978. 16. Bennett N. Open Plan Schools: Teaching, Curriculum, Design. Windsor, UK: NFER Publishing Company Ltd; 1980. 17. Bennett N, Andreae J, Hegarty P, Wade, B. Open Plan Schools: Teaching, Curriculum, Design. Windsor, UK: Schools Council Publications (NFER); 1980. 18. Bennett N. The organisation of teaching and curriculum in open plan schools. In: McNicholas J, editor. Aspects of Education no. 21: Open Plan Primary Schools. Hull, UK: University of Hull; 1978. 19. Walsh D. Noise levels and annoyance in open plan educational facilities. J Archit Res 1975;4:5-16. 20. Heppell S, Chapman C, Millwood R, Constable M, Furness J. Building learning futures. Available from: http://www.rubble.heppell.net/cabe/final_report.pdf. 21. Washnor E. Innovative Pedagogy and School Facilities. Minneapolis, USA: DesignShare.com; 2003. 22. Spring M. Bexley Academy: Qualified Success. Building 13 June 2008. 23. Department for Children, Schools and Families (DCSF). Schools for the Future. Project Faraday, Exemplar Designs for Science. Available from: https://www.mail.lsbu.ac.uk/exchweb/bin/redir.asp?URL=http://www.teachernet.gov.uk/docbank/index.cfm?id=12523. 24. Costa M. Teacher adaptations to an open area teaching and learning environment. Educ Insights. Available from http://www.ccfi.educ.ubc.ca/publication/insights/v08n03/articles/costa.html. 25. Bennett N. Open plan primary schools: Findings and implications. Educ 1980;8:45-50. 26. National Union of Teachers (NUT). Open planning with special reference to primary schools. London, UK: NUT Publications; 1975. 27. Bennett N, Batley D. Pupils′ reactions to open plan. Educ 1977;5:20-3. 28. Irish National Teachers′ Organisation. Co-operative teaching in shared area classrooms. 1984. 29. Stern C, Keislar E. Teacher attitudes and attitude change: A research review. J Res Dev Educ 1997;10:63-76. 30. Weinstein C. Noise and reading performance in an open space school. J Educ Res 1977;72:210-3. 31. Jarman C. The organisation of primary schools: The oxfordshire experience. In: Bell S, editor. The Organisation of Open Plan Primary Schools: A National Course. Glasgow, UK: Jordanhill College of Education; 1978. 32. Kyzar BL. Comparison of instructional practices in classrooms of different design. Final Report. USA: Northwestern State University; 1971. 33. Galton M. Inside the primary classroom. London, UK: Routledge; 1980. 34. Kingsbury H, Taylor D. Acoustical conditions in open plan classrooms. Sound Vib 1970;4:19-24. 35. Yerges JF, Bollinger JG. Development and utilization of open plan educational facilities. Sound Vib 1972;6:19-24. 36. Schellenberg B. Noise and sound control in open plan schools. Available from: US Dept. of Health Education and Welfare;1975. http://www.eric.ed.gov/PDFS/ED109801.pdf. 37. California State Department for Education USA. School sound level study. School Facilities and Transportation Division; 1986. 38. Schneider M. Do school facilities affect academic outcomes? Washington DC, USA: National Clearinghouse for Educational Facilities; 2002. 39. Earthman GI. Where children learn: A discussion of how a facility affects learning. Annual meeting of Virginia Educational Facility Planners (ED419368); February 1998. 40. Crandell C, Smaldino J, Flexer C. Sound field FM amplification: Theory and practical applications. Los Angeles, USA: Singular Press; 1995. 41. Nabelek A. Room acoustics and speech perception. In: Katz J, editor. Handbook of Clinical Audiology. Baltimore, USA: Williams and Wilkins; 1994. 42. Shield BM, Dockrell JE. The effects of noise on children at school: A review. J Build Acoust 2003;10:97-116. 43. Shield B, Dockrell J, Asker R, Tachmatzidis I. The effects of noise on the attainments and cognitive development of primary school children. Final report for Department of Health and DETR; 2002. 44. Shield B, Dockrell J. The effects of environmental and classroom noise on the academic attainments of primary school children. J Acoust Soc Am 2008;123:133-44. 45. Hygge S. Classroom experiments on the effects of difference noise sources and sound levels on long-term recall and recognition in children. Appl Cogn Psychol 2003;17:895-914. 46. Lercher P, Evans GW, Meiss M. Ambient noise and cognitive processes among primary school children. Environ Behav 2003;35:725-35. 47. Dockrell J, Shield B. Acoustical barriers in classrooms: The impact of noise on performance in the classroom. Br Educ Res J 2006;32:509-25. 48. Evans GW, Maxwell L. Chronic noise exposure and reading deficits: The mediating effects of language acquisition. Environ Behav 1997;29:638-57. 49. Lukas JS, DuPree RB, Swing JW. Effects of noise on academic achievement and classroom behavior. Office of Noise Control, California Dept. of Health Services. Report no. FHWA/CA/DOHS-81/01. Sept 1981. 50. Bronzaft AL, McCarthy DP. The effect of elevated train noise on reading ability. Environ Behav 1975;7:517-27. 51. Bronzaft AL. The effect of a noise abatement program on reading ability. J Environ Psychol 1981;1:215-22. 52. Haines MM, Stansfeld SA, Brentall S, Head J, Berry B, Jiggins M, et al. West London schools study: The effects of chronic aircraft noise exposure on child health. Psychol Med 2001;31:1385-96. 53. Maxwell LE, Evans GW. The effects of noise on pre-school children′s prereading skills. J Environ Psychol 2000;20:91-7. 54. Evans GW, Lepore SJ. Non-auditory effects of noise on children: A critical review. Child Environ 1993;10:31-51. 55. Hetu R, Truchon-Gagnon C. Problems of noise in school settings: A review of literature and the results of an exploratory study. J Speech Lang Pathol Audiol 1990;14:31-8. 56. Sanz S, Garcia AM. Road traffic noise around schools: A risk for pupil′s performance? Int Arch Occup Environ Health 1993;65:205-7. 57. Barnett DL, Nichols AC, Gould DG. The effects of open space versus traditional on the auditory selective attending skills of elementary schools children. Lang Speech Hear Serv Sch 1982;13:138-43. 58. Fisher K. A critical pedagogy of space. PhD Thesis. University of South Australia; 2000. 59. Cohen S, Evans GW, Krantz DS. Physiological, motivational and cognitive effects of aircraft noise on children moving from the laboratory to the field. Am Psychol 1980;35:231-43. 60. Dockrell JE, Shield BM. Children′s perceptions of their acoustic environment at school and at home. J Acoust Soc Am 2004;115:2964-73. 61. Alcantara JI, Weisblatt EJ, Moore BC, Bolton PF. Speech in noise perception in high-functioning individuals with autism or Asperger′s Syndrome. J Child Psychol Psychiatry 2004;45:1107-14. 62. Byrne C, Dillon H, Khann T. An international comparison of long-term average speech spectra. J Acoust Soc Am 1994;96:2108-20. 63. Nelson PB. Sound in the classroom: Why children need quiet. ASHRAE J February 2003. p. 22-5. 64. Mayo L, Florentine M, Buus S. Age of secondary language acquisition and perception of speech in noise. J Speech Lang Hear Res 1997;40:686-93. 65. Nelson PB, Soli S. Acoustical barriers to learning: Children at risk in every classroom. Lang Speech Hear Serv Sch 2000;31:356-61. 66. Nelson PB. Classroom noise and children learning through a second language: Double Jeopardy? Lang Speech Hear Serv Sch 2005;36:219-29. 67. Nabelek AK, Donahue AM. Perception of consonants in reverberation by native and non-native listeners. J Acoust Soc Am 1984;75:632-4. 68. Bovo R, Ciorba A, Abenante L, Busi M, Martini A. Effects of classroom noise and reverberation on the speech perception of bilingual children learning in their second language. Proc Inst Acoust 2008;30:662-6. 69. Department of Education and Science (DES). Children and their Primary Schools: A report of the Central Advisory Council for Education (England). Vol. 1: The Report. (′Plowden Report′). HMSO, London, UK; 1967. 70. Bradlow AR, Kraus N, Hayes E. Speaking clearly for children with learning disabilities: Sentence perception in noise. J Speech Lang Hear Res 2003;46:80-97. 71. Breier JL. Dissociation of sensitivity and response bias in children with attention deficit/hyperactivity disorder during central auditory masking. Neuropsychology 2002;16:28-34. 72. Bess FH, Dodd-Murphy J, Parker RA. Children with minimal sensorineural hearing loss: Prevalence educational performance and functional status. Ear Hear 1998;19:339-54. 73. Metropolitan Toronto School Board (Ontario). E6: Academic Evaluation. A Report on SEF Open Plan Schools; 1975. 74. Yerges LF. The open plan school revisited. Noise Control Engl 1976;6:22-9. 75. Knez I, Hygge S. Irrelevant speech and indoor lighting: Effects on cognitive performance and self-reported affect. Appl Cogn Psychol 2002;16:709-18. 76. Finitzo-Hieber T, Roeser R, Downs D. Classroom Acoustics. In: Roeser RJ, Downs MP, editors. Auditory disorders in school children. San Diego: Thieme; 1988. p. 221-33. 77. Krutchen PM. Survey of teachers′ perceptions in open area schools. USA: University of Calgary; 1971. 78. Murray NE. The opinions of teachers teaching in open space elementary schools in the Windsor Separate School Board. Michigan, USA: Wayne State University; 1971. 79. Justus JE. An educator views open spaces and the planning process. CEFP J 1971;9:12-4. 80. Ledbetter TA. A study of open spaces for teaching. USA: University of Tenessee; 1969. 81. Kingsbury H. Acoustics in the changing classroom. Educ Technol March 1973. p. 62-4. 82. Shield BM, Dockrell JE. External and internal noise surveys of London Primary Schools. J Acoust Soc Am 2004;115:730-8. 83. Picard M, Bradley JS. Revisiting speech interference in classrooms. Audiology 2001;40:221-44. 84. MacKenzie D. Noise sources and levels in UK schools. Proc Int Symp on Noise Control and Acoustics for Ed Buildings. Istanbul, Turkey: Proc Turkish Acoust Soc; 2000. p. 97-106. 85. Airey S. A survey of acoustical standards in UK classrooms and their effect on pupils and teachers. Proc Inst Acoust 1998;20:14-21. 86. Hay B. A pilot study of classroom noise levels and teachers′ reactions. Voice 1995;4:127-34. 87. Moodley A. Acoustic conditions in mainstream classrooms. J Br Assoc Teach Deaf (BATOD) 1989;13:48-54. 88. Sato H, Bradley JS. Evaluation of acoustical conditions for speech communication in working elementary school classrooms. J Acoust Soc Am 2008;123:2064-77. 89. Charlton Smith Partnership. Design for educationally appropriate acoustic characteristics in open plan schools. Research Report to The Scottish Executive; 2005. 90. Charlton-Smith N. Some acoustic issues in open plan schools. Proc Inst Acoust 2003;25:141-7. 91. Department for Education and Skills. Building Bulletin 93 Acoustic Design of Schools. TSO, London. Available from: http://www.teachernet.gov.uk/acoustics. 92. Mackenzie DJ, Airey S. Classroom Acoustics: A research project (Summary Report). Heriott-Watt University; 1999. 93. Kyzar BL. Comparison of instructional practices in classrooms of different design. Final Report. Northwestern State University, USA; 1971. 94. Fitzroy D, Reid JL. Acoustical environment of school buildings. Technical Report 1. Educational Facilities Laboratories. New York; 1963. 95. Airey SL, MacKenzie DJ, Craik RJ. Can you hear me at the back? Effective communication in classrooms. In: Carter N, Job RF, editors. Proc 7th Int Congress on Noise as a Public Health Problem. Vol. 1. Sydney: Noise Effects ′98; 1998. p. 195-9. 96. Hamman S. Sound polluted schools. Sch Manage 1970;14:14-5. 97. Choudhury NK. Sound diffraction around moveable partitions in teaching spaces. Educational Building Report 1, Bangkok; 1973. 98. Durlak JT, Lehman J. User awareness and sensitivity to open space: A study of traditional and open plan schools. In: Canter DV, Lee T, editors. Psychology and the Built Environment. London, UK: Architectural Press; 1974. 99. Brunetti FA. Open Space: A status report. Memo No. 1 School Environment Study, Stanford University, California, USA; 1971. 100. Greenland E, Shield B, Dockrell J. Control of noise for speech intelligibility in open plan classrooms. Proc Euronoise 2009. Scotland, UK: Edinburgh; 2009. 101. Miller JD. Effects of noise on people. J Acoust Soc Am 1974;56:729-64. 102. Houtgast T. The effect of ambient noise on speech intelligibility in classrooms. Appl Acoust 1981;14:15-25. 103. American Speech-Language-Hearing Association. Acoustics in educational settings: Position statement. Available from: http//www.asha.org. 104. Bradley JS. Speech intelligibility studies in classrooms. J Acoust Soc Am 1986;80:846-54. 105. Bradley JS, Sato H. The intelligibility of speech in elementary school classrooms. J Acoust Soc Am 2008;123:2078-86. 106. Yang W, Bradley JS. Effects of room acoustics on the intelligibility of speech in classrooms for young children. J Acoust Soc Am 2009;125:922-33. 107. Petersen CM. Children and noise - prevention of adverse effects. Denmark: National Institute of Public Health; 2002. 109. Greenland E, Shield B, Dockrell J. Acoustics in open plan classrooms - towards revised speech intelligibility criteria. Proc Inst Acoust 2009;31. 110. Bradley JS. From speech privacy to speech security. Revista de Acustica 2007;38:103-27. 111. Erhvervs-og Boligstyrelsen. Vejledning om lydforhold i undervisnings-og daginstitutionsbyggeri. (Guidance on acoustics in teaching and day-care centre construction). Available from: http://www.ebst.dk/file/1920/vejledning_om_lydforhold_institutioner.pdf. 112. Swedish Standards Institute SIS. SS 25268:2007 Acoustics - Sound classification of spaces in buildings - Institutional premises, rooms for education, preschools and leisure-time centres, rooms for office work and hotels; 2007. 113. American National Standards Institute. Standard S12.60-2002. Acoustical Performance Criteria, Design Requirements, and Guidelines for Schools; 2002. 114. School Facilities and Transportation Division. School sound level study, California State Department for Education USA; 1986. 115. Department for Education and Science (DES). Architects and Building Branch Paper No. 3: Delf Hill Middle School (an appraisal). London: HMSO; 1978. 116. Smith N. Some acoustic problems of open plan schools. Nottingham, UK: University of Nottingham; 1974. 117. Metropolitan Toronto School Board (Ontario). Toronto, Canada: Hints for survival in open plan schools; 1973. 118. Frese CW. Give your school the silent treatment. American Sch Univ 1973;46:47-52. 119. Webb R, Vulliamy G. The impact of New Labour′s education policy on Teachers and Teaching at Key Stage 2. FORUM 2006;48:145-58. 120. Pake J, Harlen W, Powney J. Teachers′ and Pupils′ days in the primary classroom, SCRE Research Report No. 93. The Scottish Council for Research in Education; 1999. 121. Department for Education and Science (DfES). Building Bulletin 99: Briefing Framework for Primary School Projects. Incorporating primary school revision to BB82: Area Guidelines for Schools. London: HMSO; 2004. 122. Wall K, Dockrell J, Peacey N. Research Survey 6/1 Primary schools: The built environment. The Primary Review. Cambridge, UK: University of Cambridge; 2008. 123. Crandell C, Smaldino J. An update of classroom acoustics for children with hearing impairment. Volta Rev 1995;96:291-306. 124. Dockrell J, Shield B, Rigby K. Acoustic guidelines and teacher strategies for optimising learning conditions in classrooms for children with hearing problems. In: Fabry DA, Johnson CD, editors. Access: Achieving Clear Communication Employing Sound Solutions 2003. Proceedings of the First International Conference. Phonak AG; 2004. Connolly, D.M. and Dockrell, J.E. and Shield, B.M. and Conetta, R. and Cox, T.J. Lo, A.H.C. and McPherson, B.
Greenland, E.E. and Shield, B.M.